When you first see Preston Mill you might think you’ve taken a step back in time. 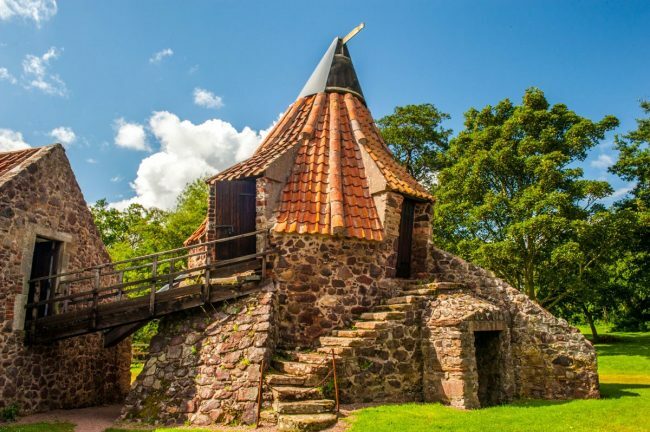 With its curious Dutch-style conical roof, the mill is an architectural oddity that will beguile visitors as much as it delights painters and photographers. Preston Mill was used commercially until 1959 and was the region’s last working watermill. Guided tours reveal the gruelling nature of the miller’s work, from heavy lifting to dealing with floods, mice and dust. Just across the River Tyne lies the unusual structure of Phantassie Doocot, built in the 16th century to house 500 pigeons. Nestled within an idyllic location, the grounds surrounding Preston Mill offer access to several tranquil walks. Spot the locations featured in the hit TV series Outlander.